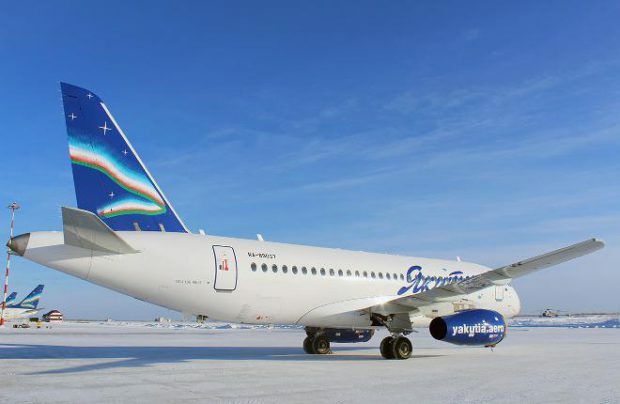 Yakutia Airlines has accepted another Sukhoi Superjet 100 (SSJ 100) jet, the fifth of the type in its fleet. It leases the aircraft from GTLK State Transport Leasing Company through a special program offering favorable payment terms for the Russian-built regional jet. According to the airline, the aircraft with tail number RA-89037 (MSN 95077) landed at Yakutsk Airport on February 7. It is one of the three aircraft leased through GTLK. The lessor is expected to deliver two more SSJ 100s to Yakutiya which will replace a pair of similar aircraft leased earlier through VEB-Leasing. Yakutia’s new SSJ 100 left the assembly line in November 2016. It is an extended-range version, dubbed SSJ 100LR. The aircraft features a single economy class cabin layout with 103 seats. RA-89037 is scheduled to enter commercial service with the operator next week. It will mostly fly on routes across Russia’s Far East, but occasional flights to China, Japan and South Korea are not excluded. All three SSJ 100s leased through GTLK are enrolled in a special program offered to Russian regional carriers. Whereas VEB-Leasing set its leasing rate in hard currency, GTLK offers rates in rubles.